The reporter of the “Klekánice” programme on ČT became this year’s winner of the Ferdinand Peroutka journalist prize. She received this reward for her persistent uncovering of political and business corruption. Among others articles that gained her fame was the case revealing the fraud related to oil for heating. Hats off to the director of the Pardubice factory of the Taiwan computer producer Foxconn CZ, which produced 2 million computers last year. It reached record turnover of CZK 35 billion and became one of the largest companies in the Czech Republic. According to The Public Opinion Poll Center, the minister of the interior is consistently the most popular Czech politician (voted by 72% of citizens). The second “popularity” place belongs to minister of defence Jaroslav Tvrdík and the third to minister of education Petra Buzková. The director of the Czech statistical office resigned when Eurostat confirmed the mistake of ČSÚ’s calculations, which omitted CZK 40 billion of exported goods. The statistics are crucial for those who thought the economy situation is worse than it really is, and planned their budgets accordingly. Even after six months, the chairman of the United Nations Organization General Assembly does not have his security screening, which he needs in order to chair the assembly and become an employee of the ministry of foreign affairs again. The general director of Sazka did not get the state guarantees for bank loans, thus endangering the organization of World Ice Hockey Championships in Prague as of spring 2004. Sazka, the investor for the new sports stadium’s construction, has not paid for the plots on which it should be situated. THE CO-FOUNDER OF the humanitarian organization People In Need, Šimon Pánek (35), is the first Czech ever to win the European of the Year award. He was thus designated by 19 European Reader’s Digest editors for his ten years of contributing to the development of democracy. “I’m happy, and I see this award as approbation of one of the most successful Czech non-governmental organizations,” Pánek says. “Perhaps it will help us shed our image as an eastern organization in an international context, receiving the same treatment as our western colleagues,” notes this young man, whom the public remembers as one of the main actors in the “Velvet Revolution” of 1989. When asked why he didn’t go into politics as his “velvet colleagues” Martin Mejstřík and Monika Pajerová did, he explains that politics isn’t a goal he strives for. He sees his work for his organization as a sufficient challenge. “The basic idea of People In Need is to struggle against ignorance and dictators, be they in Chechnya, Bosnia, or Cuba. Problems between Czechs and Roma are also of concern,” he explains. 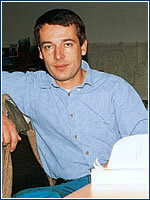 Pánek is very busy in his position as the director of the emergency and development aid department. Besides distributing the money that was collected for people afflicted by last year’s floods, he is getting ready to launch new projects in Africa. He wants to establish a “Friends of People In Need Club” and to concentrate on the possibility of receiving some funding from the EU. He is also involved in charity, having donated the CZK 300,000 connected with his European of the Year award to widows and orphans of Nepalese killed by Maoist fighters. MICHAL SUCHÁNEK (58) is one of the three co-owners of the largest bookstore in central Europe and one of the ten largest stores in all of Europe. Last year he and his partners opened Palác knih Luxor in Wenceslas Square, a four-level megastore that boasts sales areas totalling 3,500 m2 and over 35,000 titles. 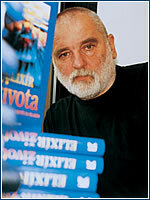 Suchánek is glad he can draw on his life-long work in book sales, as under the last regime he managed bookshops in the Prague Castle and Slovanský dům on Na Příkopě street. At an age when most people are slowing down in their work, this entrepreneur shines with optimism when he explains the uniqueness of Palác knih Luxor. “We aren’t the best solely in terms of space, but thanks also to the uniqueness and extent of our offer,” Suchánek points out. “We carry everything that’s on the market, and every day there’s an event – book signings, openings, release celebrations, author readings, benefits, and programs for children,” he says, ticking off the store’s various activities. He adds that the store is visited heavily not only by book lovers but also by students who access the internet and foreigners who can choose from a wide selection of non-Czech literature and translations of works by Czech writers. The three owners currently operate six stores in Prague, but they plan on entering other large cities. For example, in Brno they want to open a similar megastore this year. Why does he think Czechs are making fewer purchases in small, cozy shops and shifting their business to giant shopping centers? “It’s because of the convenience. We always try to meet their needs and be nice to them. It pays off – people remember it, and they come back,” Suchánek remarks.